Mobility For supporting mobility and for use after orthopaedic surgery or trauma. New Zealand Green-Lipped-Mussel extract with cartilage precursors to hep maintain mobility. EPA/DHA for additional support in helping maintain joint health. 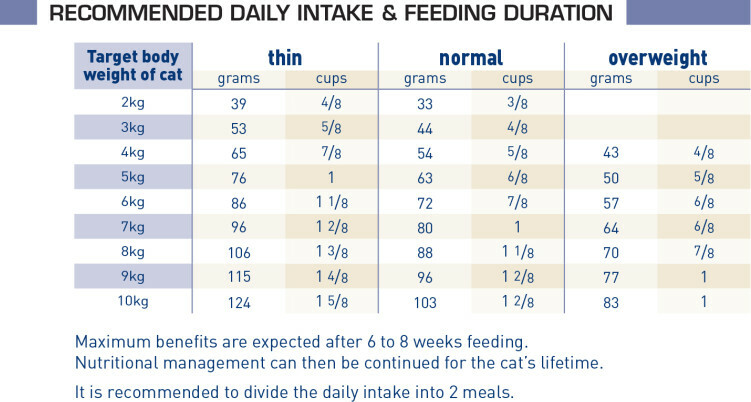 A moderate phosphorus intake to help support healthy kidney function, particularly in the older cat. The synergisitic antioxidant complex helps neutralise free radicals. Maize flour, maize, rice, wheat gluten*, dehydrated poultry protein, maize gluten, animal fats, vegetable fibres, hydrolysed animal proteins, fish oil, soya oil, chicory pulp, minerals, Fructo-Oligo-Saccharides (FOS), psyllium husks and seeds, New Zealand green-lipped mussel extract (GLM 0.3%), hydrolysed yeast (source of Mannan-Oligo-Saccharides), hydrolysed crustaceans (source of glucosamine), hydrolysed cartilage (source of chondroitin), marigold extract (source of lutein). Crude ash: 5.8%. Crude fibre: 4.7%. Crude oil fats: 15%. Moisture: 5.5%. Protein: 28%. Vitamin A: 20500IU, Vitamin D3: 700IU, E1 (Iron): 51mg, E2 (Iodine): 4mg, E4 (Copper): 8mg, E5 (Manganese): 66mg, E6 (Zinc): 218mg, E8 (Selenium): 0.1mg. Preservatives - Antioxidants.